The Southern Colonies included Maryland, Virginia, North Carolina, South Carolina, and Georgia. The Appalachian Mountains bordered the colonies to the west and the Tidewater (flat land along the coast) bordered the colonies to the east. The soil and climate in the Tidewater was great for growing warm-weather plants like tobacco, rice, and indigo. Because of this large plantations formed along the rivers and coastal areas. The economy in the Southern Colonies was very rich. Maryland based its economy on growing tobacco. Because growing tobacco was such back-breaking work, most tobaccos workers were slaves or indentured servants. 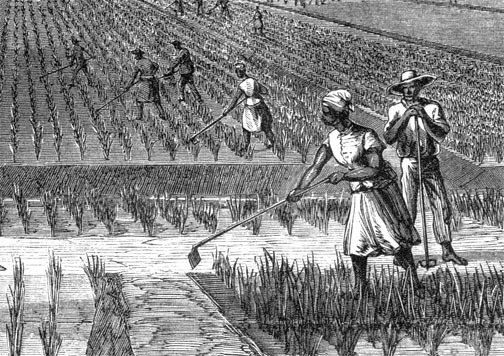 The Carolinas started growing and exporting rice in the 1690's, they learned to cultivate rice from the African slaves they used to grow rice. Slave labor was very important in the Southern Colonies. More Africans were being enslaved to work on plantations. Almost all of the economy in the Southern Colonies was based on Agriculture. In Europe Catholics and Protestants had been fighting for a century, King Charles felt sympathy for the Catholics and granted Lord Baltimore land to build a colony in America. In this colony Catholics wouldn't be prosecuted. Many other people came to the colony including Huguenots or French Protestants, English, German, Swiss, and Scottish. Protestants like Puritans came to the colony. The main reason for this colony was religious freedom but the founders of the Southern Colonies were mostly out to make money. 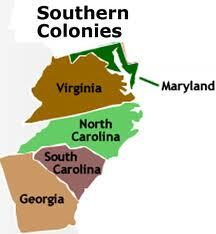 The Southern Colonies were formed to be a new kind of society free from Europe's religious conflicts. In 1649 the Act of Toleration outlawed any religious persecution. Colonists in the Southern Colonies were allowed to elect an assembly. Maryland was a proprietary colony and was governed by a single owner. Catholics in this colony were outnumbered by Protestants. The Puritans tried to gain control of the colony in 1645 and dismissed Maryland's governor in 1654. The Puritans also got rid of the Act of Tolerance and replaced it with an Anti-Catholic law. Eventually the Act of Tolerance was restored. The people in the colonies were outnumbered by slaves and feared they would revolt. School-aged kids were taught at home by their parents or private tutors and when kids were teenagers they would go to college or to Europe. Girls in the Southern Colonies did not go to school.